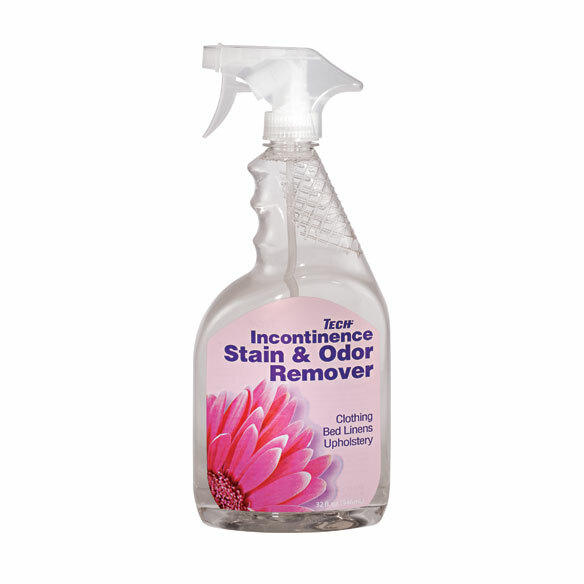 Incontinence Odor and Stain Remover - 32 Fl. Oz. Incontinence odor and stain remover naturally and permanently removes stains and odors from clothing, bedding, upholstery, and more. Simply spray this urine stain remover, and gentle organic ingredients work instantly, without colors, bleaches or harsh chemicals. Easy-to-use, no-rinse formula doesn’t leave behind residue. 32 fl. oz. Purified water, biodegradable surfactant blend, organic sassafras, natural stabilizers and proprietary natural catalyst neutralizer. No Solvents, No Alcohol, No Bleach. Safe to use on any water washable fabric. Not a personal care item. Always test for color fastness in an inconspicuous area. Remove any loose material, soil, or excess liquid. Apply directly to the stained area and allow to penetrate. Moisten a cloth with warm water and blot the stained area in a circular pattern. Do not rub stain; rubbing can spread the stain. For bed linens, blankets and clothing: apply to effected area. Allow to completely penetrate fabrics, launder per fabric instructions. It is safe to soak water-washable fabrics in Incontinence Odor and Stain Remover. I will buy this product again because it worked real good. I would tell people to use this because I did and it really works. There is no smell and the stain comes out. An outstanding product. Removes urine odor and stains completely and lots of other difficult stains such as fruit, coffee and chocolate stains from my microsuede upholstery and carpeting. I keep reordering it. A must-have product. HAVE USED THIS PRODUCT ON CLOTHING AND URINE SPILL AND IT DID IT'S JOB VERY WELL. Pour it in a spray bottle.Good odor killer. I h ave tried this product and it is excellent..
Best product I have ever used for incontinence laundry! Family mbr. has medical problems and this will solve some serious problems for what it is advertised for. I've started having issues. Time to be prepared. I have considerable incontinence problems. This looks like it would help. It is an amazing product and is worth every penny. I am hoping that it will remove the odors from my mother's bed. I need this . . . I wanted a spray that would remove odors from clothing. This sounded natural and I thought that I would give it a try. it accomplished the problem I was having..
can it be sprayed on skin? BEST ANSWER: Thank you for your question. The spray is not made to be on skin. It is only made for fabric items that need to be washed. We hope this information will be of help to you. No! It's for spraying on cloth before washing! BEST ANSWER: Thank you for your question. This should work on carpet. We suggest to try a small area first. We hope this information will be of help to you. good if stain is treated soon.